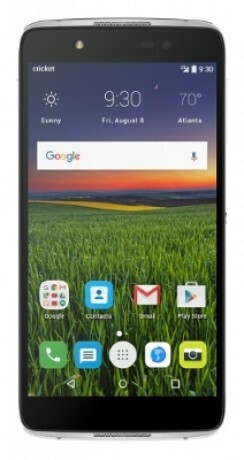 Cricket Wireless today said the Alcatel Idol 4 is now available for sale from its web site. The Idol 4 is the smaller brother of the Idol 4S. The Idol 4 has the same basic appearance as the Idol 4S, with a metal frame and glass back, and features such as JBL stereo speakers and a reversible user interface. The Idol 4 has a 5.2-inch full-HD LCD display, Snapdragon 617 processor with 3 GB of RAM, and 16 GB of storage. It has a 13-megapixel camera main camera, 8-megapixel front camera, NFC, Cat 6 LTE, memory card slot, Android 6.0, and fast charging. Cricket is charging $199 when the Idol 4 is activated on a service plan. The package includes Alcatel's virtual reality goggles. Alcatel is selling the larger Idol 4S directly to consumers through its web site for $349. Cricket Wireless today announced plans to sell the Alcatel Idol 4 beginning next month. The Idol 4 is the smaller brother of the Idol 4S.